With headquarters in beautiful Coeur d'Alene, the Idaho Panhandle NF covers about 2.5 million acres from eastern Washington to western Montana. Three of Idaho's most prominent lakes are found here: Coeur d'Alene Lake, Priest Lake and Lake Pend Oreille. The forest boasts more than 2,000 miles of trails in the summer, and more than 70 miles of cross country ski trails in the winter. Snowmobiling is popular in the winter, and the forest contains more than 1,000 miles of groomed snowmobile trails. 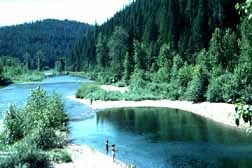 The Idaho Panhandle contains some of the state's most beautiful scenery.